Hundreds of blockchains and blockchain applications are in existence today. The whole world has become obsessed with the ideas of moving money faster, incorporating and governing in a distributed network, and building secure applications and hardware. You can see many of these public blockchains by going to a cryptocurrency exchange. 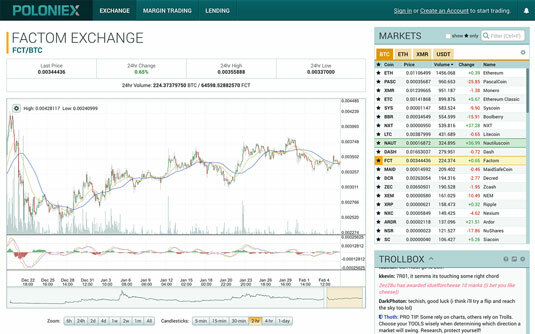 The figure shows the altcoin exchange for Poloniex, a cryptocurrency trading platform. Blockchains are moving beyond the trading value market and are being incorporated into all sorts of industries. Blockchains add a new trust layer that now makes working online secure in a way that was not possible beforehand. Most up-and-running blockchain applications revolve around moving money or other forms of value quickly and cheaply. This includes trading public company stock, paying employees in other countries, and exchanging one currency for another. Blockchains are also now being used as part of a software security stack. The U.S. Department of Homeland Security has been investigating blockchain software that secures Internet of Things (IoT) devices. The IoT world has some of the most to gain from this innovation, because it’s especially vulnerable to spoofing and other forms of hacking. IoT devices have also become more pervasive, and security has become more reliant on them. Hospital systems, self-driving cars, and safety systems are prime examples. DAOs are another interesting blockchain innovation. This type of blockchain application represents a new way to organize and incorporate companies online. DAOs have been used to organize and invest funds via the Ethereum network. Larger and longer-run blockchain projects that are being explored now include government-backed land record systems, identity, and international travel security applications. The possibilities of a blockchain-infused future have excited the imaginations of business people, governments, political groups, and humanitarians across the world. Countries such as the UK, Singapore, and the United Arab Emirates see it as a way to cut cost, create new financial instruments, and keep clean records. They have active investments and initiatives exploring blockchain. Blockchains have laid a foundation where the need for trust has been taken out of the equation. Where before asking for “trust” was a big deal, with blockchains it’s small. Also, the infrastructure that enforces the rule if that trust is broken can be lighter. Much of society is built on trust and enforcement of rules. The social and economic implications of blockchain applications can be emotionally and politically polarizing because blockchain will change how we structure value-based and socially based transactions.